There are hundreds of different bacteria living in our gut, or our colon to be precise, all working in our favour. In order to keep these little heavy working microbes in balance, we need to ensure we eat food rich in prebiotics. Here’s the problem though. The type of foods that deliver rich prebiotics aren’t all that appealing: we’re talking raw chicory root, raw leeks and garlic and under-ripe bananas. Not usually part of an average diet. As such, you may want to complement your diet with a good prebiotic supplement, and we haven’t found any better than Performance Lab® Prebiotic. Why Choose Performance Lab® Prebiotic? Before we talk in detail about Performance Lab® Prebiotic, let us admit something: we here at Supplement Reviews UK are very impressed by the Performance Lab® brand itself and the manufacturer behind it, Opti-Nutra. Opti-Nutra is the UK company which already produces Mind Lab Pro, the best nootropic on the market (in our opinion, and that of many others too). It is known for its science-first ethos and its commitment to clean and natural ingredients wherever possible. Over and over again in its Performance Lab® range, Opti-Nutra holds true to its promise to use superior versions of its ingredients – nature-identical vitamins and minerals, for instance; improved bioavailable compounds; safe but potent all-natural substances. We’re excited to find a supplement manufacturer that shares our own vision of superior, effective, clean and SAFE products. In a market full of hype and unproven buzz ingredients, it’s a rarity. Perhaps one of the things we appreciate the most about the Performance Lab® range is its innovative formulas. Opti-Nutra doesn’t just follow the pack and throw obvious ingredients into a standard fat burner, energy supplement, or in this case, prebiotic. Instead, it approaches the subject via a different mindset, often looking to improve the body’s functioning from the inside, rather than slap a plaster on the outside. Performance Lab® Prebiotic is one such case in point. Where many prebiotic supplements on the market just throw live cultures into the mix, often bombarding the gut with new strains, Performance Lab® Prebiotic is much subtler and seeks to strengthen the microflora we already have in our colon. If you’re new to prebiotics, consider it this way. A good prebiotic should help to fertilise the good bacteria in our colon. After all, if this is out of whack, it can cause all sorts of health issues. Boosting the body’s own supply of good bacteria in the colon should help enhance our absorption of nutrients from the food we eat, help with weight loss, reduce stress and boost our immunity. There is also the potential for it to reduce the risk of some diseases. How Does Performance Lab® Prebiotic Work? 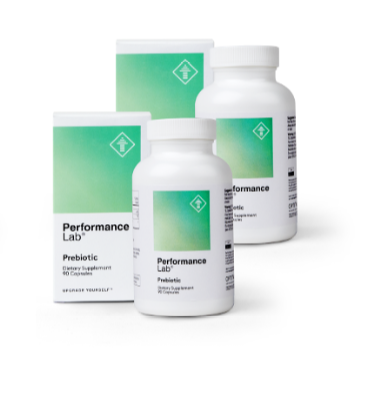 Performance Lab® Prebiotic has just one ingredient – Inulin-FOS (Fructo-Oligo-Saccharides), sourced from chicory root. Inulin-FOS is made using a clean, ethical manufacturing process called Orafti® Synergy1, which combines the health benefits of two different soluble fibres to create a 100% vegetable-origin organic prebiotic. 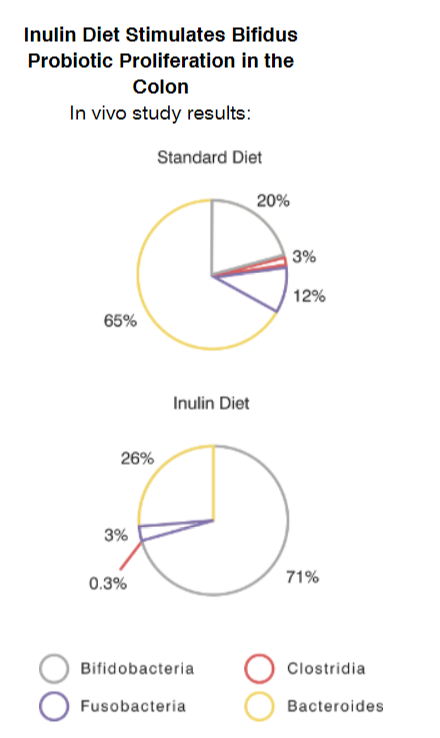 Unlike some other prebiotics, Inulin-FOS can pass through the stomach and small intestine intact, unharmed by stomach acids, to arrive in the colon, primed and ready. Once there, it selectively stimulates the development of a live probiotic bacteria, Bifidobacterium. This is a probiotic that may more easily fight the bad bacteria in the gut than other probiotic strains, hence the selective targeting by Performance Lab® Prebiotic. Bifidobacterium, therefore, helps to fight bad bacteria, breaks down food and helps the body absorb critical nutrients, prevents constipation and helps to boost the immune system. There is some evidence that it may also reduce the strength of certain potential cancer-causing enzymes. Traditional prebiotic supplements tend to: Deliver numerous new strains of probiotic, sometimes bombarding the gut with more than 10 new strains in unnatural ratios. Can cause uncomfortable or unpredictable effects. Traditional prebiotic supplements tend to: Use substances which can be easily destroyed by cold, light, heat and stomach acids, meaning you can’t predict how much will actually arrive alive in the colon to deliver digestive benefits. Versus Performance Lab® Prebiotic, which: Uses an innovative, patented and resilient form of Orafti®Synergy1 inulin-FOS fibre that can pass through stomach acid unaharmed, to arrive in the colon intact. Some traditional prebiotic supplements: Claim to include as many as 2 billion ‘live’ cultures. On investigation, however, many are ‘dead on arrival’, making the real numbers far fewer. Versus Performance Lab® Prebiotic, which: Promises to be 100% bioactive, ready to support digestive health and details the exact nutrition on the label. It is important to note that all products in the Performance Lab® range undergo extensive pre-and post-testing to ensure they deliver exactly what they promise. They are also tested to ensure they are free of GMOs, allergens, soy, gluten and synthetic additives, and are GMP certified. In short, you can trust what they say – how refreshing in the supplement industry! We haven’t hidden our liking for the Performance Lab® brand. We stand by our claims that it is one of the most superior supplement brands around. As such, we were intrigued by Performance Lab® Prebiotic and it didn’t disappoint us. Clean and safe ingredients? Yes, check. Does it also support metabolic health and immunity? Check, check and check again. Plus, bonus, it may also act as an appetite suppressant. We’re very happy to recommend Performance Lab® Prebiotic as our Best Prebiotic Supplement to Buy in the UK in 2018.